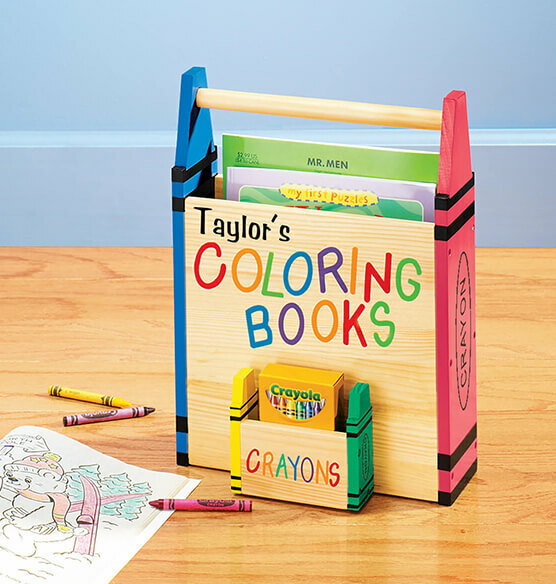 Keeping busy artists organized, this cute personalized coloring book holder corrals coloring books and crayons, keeping them tidy, together, and ready for easy toting. Coloring book storage's lightweight design features carrying handle, two compartments, and one special artist’s name! Specify name; limit 1 line, 10 letters/spaces (Please note: 's does not come standard). 10"Lx5"Wx14"H. Assembly required, instructions included. Darling product although it must be assembled. The handle fit between two holes but spins around so should be glued for sturdiness which was not included in the instructions. Personalized product will make a perfect gift! I bought these for my 2 nieces and my daughter. The personalization was too cute! The colors were great. I added a Christmas coloring book and a small pack of crayons, and I know they will all love it!! This will enable a child to keep crayons and books in one central location. Easy to carry for a young child. Helps teach organization to a child. This is the 3rd time we have ordered this product as a gift. The quality is good and the colors are very bright. We love that it is personalized and has a separate compartment for the crayons. We no longer have anyone else to buy this for. It will be a Birthday gift for a 3 year old. I have ordered several over the last year or so and will continue ordering more as needed. So well constructed, we bought TWO! This was a big hit with the little ones. The colors provide instant appeal! The Coloring Book Caddy was a hit/Great. This was a great christmas gift for my granddaughter. The colors were wonderful, and it was easy to put together. Just love it. Sent to Texas, I had bought 1 for grandchild here. very well made and so cute ! this is a gift for my grandson ! I'm sure my cousin will love it... I just didn't count on needing quite so much time needed to assemble it! I think the ad said 'some' assembly required. Looks more like 'total' assembly is required!! Bought for a cousin's son and he loved it! This is a Christmas gift for one of three young grandchildren. I cannot wait for them to open them on Christmas! I think any child would like this very, very colorful coloring book caddy. My twin grandaughters were a little young when I first gave these to them, but now they are 2 and 1/2 and just really love them. It keeps their books and colors separate so no arguments! Also, I think it helps teaching them that there is a PLACE for everything. Second one we have ordered. Good quality and sturdy wood, not cheap veneer. Having a hard time keeping it until Christmas. We want to give it to our granddaughter NOW. I did buy this product again for two more granddaughters. I gave this product to my oldest granddaughter when she was 5ish. She is now nine and still uses it. I couldn't be happier with this coloring book caddy. I purchased it for my granddaughter. I can't wait to give it to her. It is sturdy, colorful and useful. bought For 3 year old Grandson. His mom loves it.Will buy one for my grandaughter. 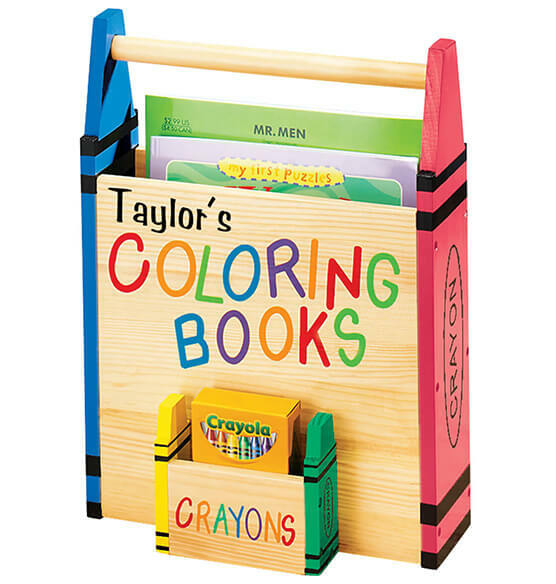 This was a great personalized gift for kids to store their coloring books and crayons. It can easily be carried to take on the go. There are a lot of pieces but didn't take long to put together. I purchased this product for each of my nieces. They love to color and its perfect for busy lifestyles. i bought this for my 2 year old grandson who just started using crayons. i am excited to give it to him for christmas. i think that he will like to go get this caddy and bring it out, and then will give him a place to put things back. the only criticism is the order of putting the caddy together did not show the need to put the crayon holder on before putting the four sides together, so i had to take a side off and then reattach, but this was a minor inconvenience. Could use a little cut in the wood at the top to get books in and out easier. But it is cute and his brother has one and likes it. It came with a scratch in the wood right below the child's name and the quality of the wood wasn''t very good. The child was excited and it was a different personalized gift. It was easy to assemble and all the holes lined up so the screws went in without a problem. Looks just like the photo. I ordered this as a Christmas gift for my little neighbor who loves to color. It was easy to put together and is now filled with coloring books and crayons, just waiting for Christmas Day. This will be easy for my little granddaughter to carry around and she will love seeing her name on it. Grandbaby loves this item! Fixing to order another one for a gift. This product is colorful, personalized, and easy to put together. Large crayon (box of 8) will not fit in front box, however, a smaller crayon (box of 8) will fit. Do not hesitate to order this item-it's so cute! I bought this for my little nephew, and he loved it! I like this because it has a nice construction, is useful and helps to keep crayons, books, paper organized. Stores away easily. They are super cute but was a little disappointed with the one that said Molly some of the paint was scratched off. Other than that they are great! That this product was made in China. They do not use correct paint for children; they use leaded paint. I need to KNOW from you that this does not have leaded paint; otherwise I will returne to you. I purchased the coloring book/crayons holder as a birthday gift for my grand daughter. I was disappointed in the quality of the product for the price paid. The item had a couple of scratches and the paint job was very poor. Not satisfied with thus purchase but it's personalized, so not able to return! Bought to use in Pre-K classroom.